Back at GDC Nvidia CEO Jen-Hsun dropped into Epic Games' press conference for an impromptu tease of the Titan X, Nvidia's next GPU (Ok, it was obviously pre-planned). Now, speaking at GTC (confusingly similar in name to GDC) Jen-Hsun has dropped a bunch more details, including the price of the X - $1000/£879 (about AU$1313) - and confirmed that it will go on sale March 18. 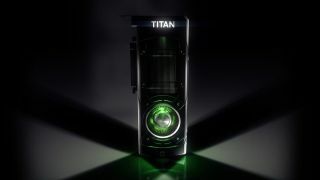 For that price you'll be getting 8 billion transistors, 3072 CUDA cores, 7 teraflops and 12GB of RAM to play with. In other words, it's pretty meaty, but it doesn't offer double precision support - you'll want the Titan Z for that. Our full review of the Titan X is already in.